Great news for professionals and demanding garden owners: STIHL's cordless hedge trimmers the HSA 66 and HSA 86 live up to professional standards for cutting performance and working comfort. Their innovative 3-in-1 performance has it all. That's because STIHL has combined three high-performance features in one: a powerful 36 V lithium ion battery, a high stroke rate and long, diamond-finished special cutters with impressive cutting capacity. 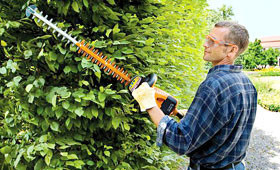 The result: first-class hedge cutting performance. Mobile, light and powerful. That's STIHL all around.